Note: Permission is granted to quote information from KocaNola.com only if the source is properly cited, including listing the KocaNola.com URL. Prior to the enormous success achieved by the Coca-Cola Company, nearly all sodas sold in the United States were manufactured by private individuals and not known by brand names. Most sodas of the mid-to-late 19th and early 20th centuries were rarely marketed outside the seller's region or state. The Coca-Cola Company became a huge success in a matter of just a few years thanks to a powerhouse advertising program that boosted sales of the beverage to national levels. Consumers couldn't pick up a magazine or newspaper without seeing the name Coca-Cola. Signs and posters proliferated on the fronts of stores and other public places. Other soda water manufacturers were quick to take notice of the advertising blitz and realized that if their drinks were to succeed in the marketplace, they had better take action, and quickly. Probably the most popular idea was to manufacture a copycat soda. By 1908, Rye-Ola, Celery-Cola, Taka-Cola, Koca Nola, and many others with similar names gave consumers a confusing choice. Many companies did not have the money to spend on national advertising and soon disappeared, but while they were in operation, they may have had a negative impact on Coca-Cola sales. To avoid direct competition with Coca-Cola, many bottling plants sold their copycat products in small towns where Coke had yet to establish a foothold. One exception was Koca Nola, a brand and company founded in Atlanta, headquarters then and now of the Coca-Cola Company. The new drink became successful under the guidance of Thomas H. Austin. In the spring of 1904 Austin established the Koca Nola Company offices at 822 Empire Building, and the bottling works at 108 Edgewood Avenue. By the spring of 1905, Austin had sold franchises in Philadelphia, Pennsylvania, Macon and Augusta, Georgia, Gallatin, Tennessee, Lumberton, North Carolina, and Montgomery, Alabama. The company's first drinks were delivered in Hutchinson bottles and later in the increasingly popular crown top bottles. It is strongly suspected that several other early Koca Nola franchises used Hutchinson bottles, but so far the only known embossed Koca Nola Hutchinsons are from Macon, Philadephia, and Jacksonville. Since no embossed Hutchinsons are known to exist from the parent Koca Nola Company in Atlanta, it is thought they utilized the new crown top method of bottling from the beginning of the firm. Some early franchises used Hutchinsons to market Koca Nola, while others utilized their stock company bottles. Thomas Austin registered the illustrated Koca Nola paper label with the office of Georgia's Secretary of State June 20, 1905. 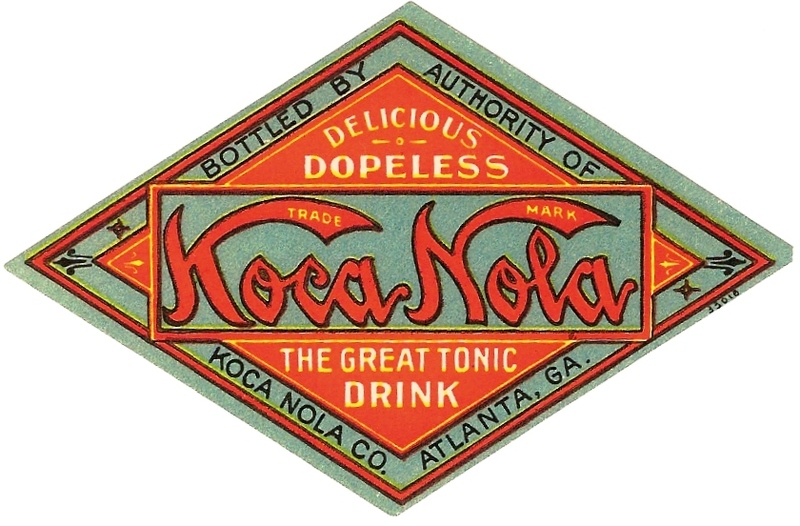 This diamond-shaped label reads "Bottled by Authority of Koca Nola Co., Atlanta, GA.," and claimed "The Great Tonic Drink" (was) "Delicious (and) Dopeless." As he continued to achieve success, Austin focused on expanding his company by soliciting drugstores and bottling works across the nation to market Koca Nola. He publicly emphasized that Koca Nola was "dopeless," most likely a thinly disguised shot at Coca-Cola, his chief rival in the soda water business. By 1909 Austin had sold Koca Nola franchises in Alabama, Connecticut, Florida, Georgia, Illinois, Indiana, Kentucky, Louisiana, Maine, Maryland, Mississippi, Missouri, New Jersey, New York, North Carolina, Ohio, Pennsylvania, South Carolina, Tennessee, Texas, Virginia, Washington, and West Virginia (and perhaps as many as 13 other states), the District of Columbia, Mexico, and Cuba. While most of the franchises bottled Koca Nola, a few only purchased the syrup to sell the drink at soda fountains and in restaurants. Regardless of whether Koca Nola was served in bottles or by the glass, it cost only 5¢ per drink, and apparently had a little extra "kick" that acted as a pick-me-up on depressing days. 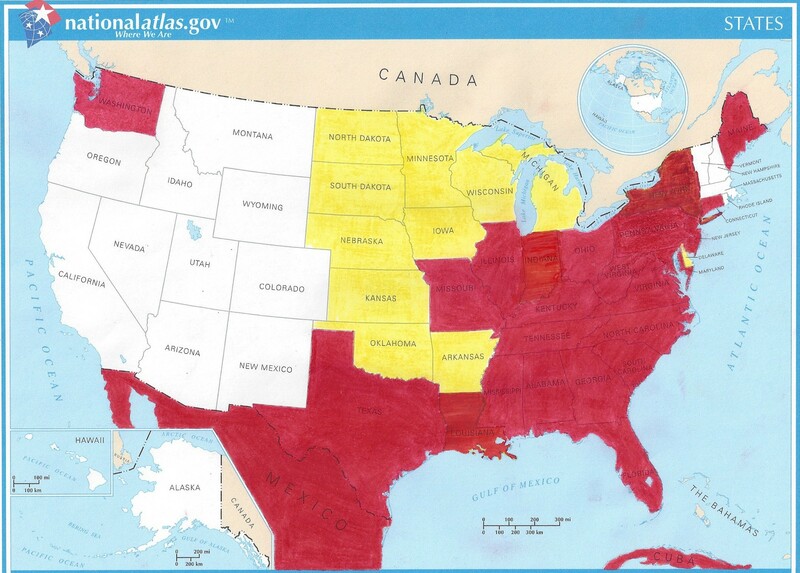 Confirmed Koca Nola franchises are highlighted in red, suspected franchises are highlighted in yellow. Map courtesy of www.nationalatlas.gov. 1906-1909 was the most successful era for Koca Nola in part because Austin borrowed a page from the marketing strategies of Coca-Cola, Pepsi-Cola, and Hires Root Beer, and gave away free merchandise advertising his soda. Merchandise from the company's Premium Plan catalog included calendars, match safes, watch fobs, lady's face powder boxes, pocket mirrors, thermometers, and trade cards. These items featured Koca Nola inscriptions and are rare collectibles today. Just when it seemed that Koca Nola would sweep the country, catastrophe struck from the U. S. District Attorney's office. On July 3, 1909, the U. S. District Attorney filed charges against the company claiming that Koca Nola syrup contained cocaine. Inspectors from the Department of Agriculture had intercepted a one-gallon jug of Koca Nola syrup shipped from the Atlanta Headquarters to a destination somewhere in the Anacostia section of the District of Columbia. The jug's label declared the contents were "Delicious, Dopeless Koca Nola, The Great Tonic Drink," and had been bottled under the regulations of the Pure Food and Drugs Act of 1906. Tests by government chemists showed that the syrup contained cocaine. Austin vigorously denied the charge, citing an independent analysis of the syrup at other labs, including the Georgia State facility "who pronounced our sirip (sic) to be entirely free from cocaine." During the trial, however, an expert witness for the Department of Agriculture testified that "drinkers of Koca Nola would soon acquire the cocaine habit and become wrecks." Judge Newman agreed with this and other testimony and found Austin guilty on four counts (each carrying a $25.00 fine), including failing to declare the presence of cocaine, and adulteration. This setback for Austin was the beginning of the end for his Koca Nola Company. Once word was out that his soda had cocaine in it, consumers quit buying it and one-by-one the franchises went out of business due to declining sales. The Koca Nola Company filed for bankruptcy November 24, 1910, but managed to hang around until 1918 before fading from the scene. 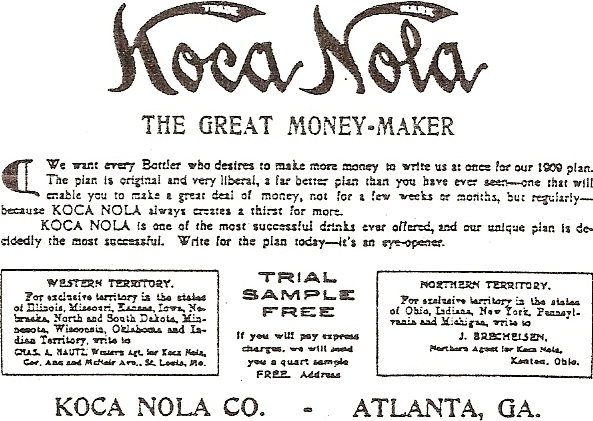 Interestingly, James Esposito of Philadelphia, Pennsylvania, continued to market Koca Nola soda for several years after the demise of the Atlanta home office. It is as yet unknown where he purchased his syrup. Esposito had been in the soda water manufacturing business for a full decade before he obtained his Koca Nola franchise in 1905. Koca Nola was one of his best sellers, if not the best. All available information concerning each of the confirmed franchises will be included when the Koca Nola book is published. We desperately need additional information you might have about these bottlers - years of operation, owners' names, addresses, bottling plant photos, photos of bottles, copies of advertisements, bottle maker marks, etc. Augusta: Dixie Carbonating Company, a subsidiary of the Augusta Brewing Co.
Bagley (near Americus): B. I. Taylor & Co.